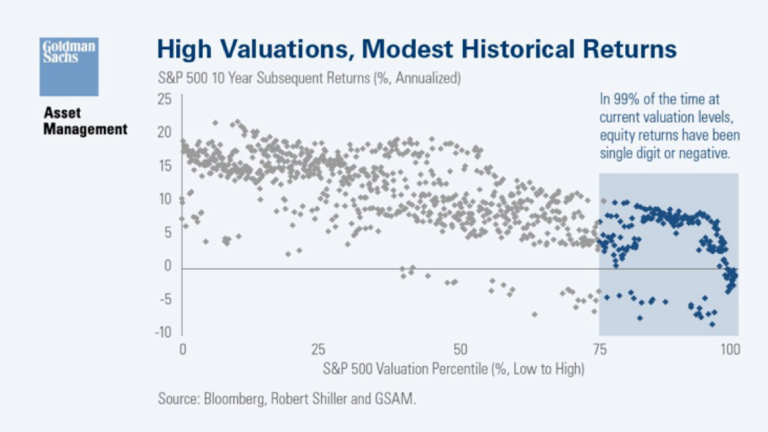 The implications of high valuations on investor outcomes is negative. For those investors that are or will be pulling from portfolios during retirement, diversification is not enough. Justin Sibears wrote a great article discussing this topic: What a Low Return Outlook Means for Your Retirement? Here’s the summary. Withdrawing 4% from a 60/40 portfolio is no longer safe. 60% allocated to stocks where returns are expected to be lower than average and risks are higher than normal. See GSAM’s chart below and our recent post for more on that. Looking at the remaining 40% in bonds doesn’t give much relief. Current yields are pitiful and the projected path of interest rates (up) does not exude confidence for any appreciation in bond prices as they are inversely correlation with rates. Justin shows that the results are better with higher allocations to stocks. Man, that’s hard to swallow. Allocate to a risky asset class when valuations are at extremes? Looks good on paper, but advisors are well aware and concerned about the behavioral nightmare that could ensue if you increase volatility for investors beyond what they can tolerate. The initial reaction may be to stay put in a more conservative allocation and hope that future returns are not as bad as what many are projecting. Here’s the problem with that, what if returns are that bad? Short term risk-avoidance is increasing future risk, and that future risk is the worst of all types. You’re effectively swapping (potential) volatility risk for the risk of bleeding portfolios dry. To enhance investor outcomes, more equity is needed, but how that equity is added should be unique in exposure due to the increased risks embedded with today’s valuations. Diversification within asset classes is not enough. There has to be strategy diversification. I’m not talking small, mid, large. They all become one asset class during turbulent market environments. I’m talking trend following and tail hedging. Unique strategies that provide access to equities with dynamic forms of risk management. Here’s an article we wrote about Trendfollowing’s ability to improve outcomes. In addition, here is a paper addressing how trendfollowing can enhance sustainable withdrawal rates. We will be out with more info on the tail hedging piece but for now, we want to make the point that strategy diversification is critical in an environment like the current. More to come on the benefits of multiple forms of risk management beyond diversification…much more.